Hooks was started in 1900 by John A. Hook. 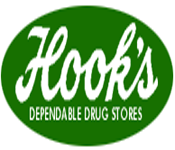 Hooks was very popular in the mid west including Indiana and in 1994 it was acquired by Revco. Revco was then acquired by CVS in 1997. Many of the old Hooks Locations are now CVS.